The traditional spinning hard drive (HDD) is the basic nonvolatile storage on a computer. That is, it doesn’t “go away” like the data on the system memory when you turn the system off. Hard drives are essentially metal platters with a magnetic coating. That coating stores your data, whether that data consists of weather reports from the last century, a high-definition copy of the Star Wars trilogy, or your digital music collection. A read/write head on an arm accesses the data while the platters are spinning in a hard drive enclosure. An SSD does much the same job functionally (saving your data while the system is off, booting your system, etc.) as an HDD, but instead of a magnetic coating on top of platters, the data is stored on interconnected flash memory chips that retain the data even when there’s no power present. The chips can either be permanently installed on the system’s motherboard (like on some small laptops and ultrabooks), on a PCI/PCIe card (in some high-end workstations), or in a box that’s sized, shaped, and wired to slot in for a laptop or desktop’s hard drive (common on everything else). These flash memory chips differ from the flash memory in USB thumb drives in the type and speed of the memory. That’s the subject of a totally separate technical treatise, but suffice it to say that the flash memory in SSDs is faster and more reliable than the flash memory in USB thumb drives. SSDs are consequently more expensive than USB thumb drives for the same capacities. Hard drive technology is relatively ancient (in terms of computer history). There are well-known pictures of the infamous IBM 350 RAMAC hard drive from 1956 that used 50 24-inch-wide platters to hold a whopping 3.75MB of storage space. This, of course, is the size of an average 128Kbps MP3 file, in the physical space that could hold two commercial refrigerators. The IBM 350 was only used by government and industrial users, and was obsolete by 1969. Ain’t progress wonderful? The PC hard drive form factor standardized in the early 1980s with the desktop-class 5.25-inch form factor, with 3.5-inch desktop and 2.5-inch notebook-class drives coming soon thereafter. The internal cable interface has changed from Serial to IDE to SCSI to SATA over the years, but it essentially does the same thing: connects the hard drive to the PC’s motherboard so your data can be processed. Today’s 2.5- and 3.5-inch drives use SATA interfaces almost exclusively (at least on most PCs and Macs). Capacities have grown from multiple megabytes to multiple terabytes, an increase of millions fold. Current 3.5-inch HDDs max out at 6TB, with 2.5-inch drives at 2TB max. 275 The SSD has a much more recent history. There was always an infatuation with non-moving storage from the beginning of personal computing, with technologies like bubble memory flashing (pun intended) and dying in the 1970s and ’80s. Current flash memory is the logical extension of the same idea. The flash memory chips store your data and don’t require constant power to retain that data. The first primary drives that we know as SSDs started during the rise of netbooks in the late 2000s. In 2007, the OLPC XO-1 used a 1GB SSD, and the Asus Eee PC 700 series used a 2GB SSD as primary storage. The SSD chips on low-end Eee PC units and the XO-1 were permanently soldered to the motherboard. As netbooks, ultrabooks, and other ultraportables became more capable, the SSD capacities rose, and eventually standardized on the 2.5-inch notebook form factor. This way, you could pop a 2.5-inch hard drive out of your laptop or desktop and replace it easily with an SSD. Other form factors emerged, like the mSATA miniPCI SSD card and the DIMM-like SSDs in the Apple MacBook Air, but today many SSDs are built into the 2.5-inch form factor. The 2.5-inch SSD capacity tops out at 1TB currently, but will undoubtedly grow as time goes by. Maximum and Common Capacity: As seen above, SSD units top out at 1TB, but those are still very rare and expensive. You’re more likely to find 128GB to 500GB units as primary drives in systems. You’d be hard pressed to find a 128GB HDD in a PC these days, as 250 or even 500GB is considered a “base” system in 2014. Multimedia users will require even more, with 1TB to 4TB drives as common in high-end systems. Basically, the more storage capacity, the more stuff (photos, music, videos, etc.) you can hold on your PC. While the (Internet) cloud may be a good place to share these files between your phone, tablet, and PC, local storage is less expensive, and you only have to buy it once. Fragmentation: Because of their rotary recording surfaces, HDD surfaces work best with larger files that are laid down in contiguous blocks. That way, the drive head can start and end its read in one continuous motion. When hard drives start to fill up, large files can become scattered around the disk platter, which is otherwise known as fragmentation. While read/write algorithms have improved where the effect in minimized, the fact of the matter is that HDDs can become fragmented, while SSDs don’t care where the data is stored on its chips, since there’s no physical read head. SSDs are inherently faster. Durability: An SSD has no moving parts, so it is more likely to keep your data safe in the event that you drop your laptop bag or your system is shaken about by an earthquake while it’s operating. Most hard drives park their read/write heads when the system is off, but they are flying over the drive platter at hundreds of miles an hour when they are in operation. Besides, even parking brakes have limits. If you’re rough on your equipment, a SSD is recommended. Availability: Hard drives are simply more plentiful. Look at the product lists from Western Digital, Toshiba, Seagate, Samsung, and Hitachi, and you’ll see many more HDD model numbers than SSDs. For PCs and Macs, HDDs won’t be going away completely, at least for the next couple of years. You’ll also see many more HDD choices than SSDs from different manufacturers for the same capacities. SSD model lines are growing in number, but HDDs are still the majority for storage devices in PCs. Form Factors: Because HDDs rely on spinning platters, there is a limit to how small they can be manufactured. There was an initiative to make smaller 1.8-inch spinning hard drives, but that’s stalled at about 320GB, since the MP3 player and smartphone manufacturers have settled on flash memory for their primary storage. SSDs have no such limitation, so they can continue to shrink as time goes on. SSDs are available in 2.5-inch laptop drive-sized boxes, but that’s only for convenience, as stated above. As laptops become slimmer and tablets take over as primary Web surfing platforms, you’ll start to see the adoption of SSDs skyrocket. Noise: Even the quietest HDD will emit a bit of noise when it is in use from the drive spinning or the read arm moving back and forth, particularly if it’s in a system that’s been banged about or in an all-metal system where it’s been shoddily installed. Faster hard drives will make more noise than slower ones. SSDs make virtually no noise at all, since they’re non-mechanical. Overall: HDDs win on price, capacity, and availability. SSDs work best if speed, ruggedness, form factor, noise, or fragmentation (technically part of speed) are important factors to you. If it weren’t for the price and capacity issues, SSDs would be the winner hands down. As far as longevity goes, while it is true that SSDs wear out over time (each cell in a flash memory bank has a limited number of times it can be written and erased), thanks to TRIM technology built into SSDs that dynamically optimizes these read/write cycles, you’re more likely to discard the system for obsolescence before you start running into read/write errors. The possible exceptions are high-end multimedia users like video editors who read and write data constantly, but those users will need the larger capacities of hard drives anyway. Hard drives will eventually wear out from constant use as well, since they use physical recording methods. Longevity is a wash when it’s separated from travel and ruggedness concerns. • Multimedia Mavens and heavy downloaders: Video collectors need space, and you can only get to 4TB of space cheaply with hard drives. • Budget buyers: Ditto. Plenty of space for cheap. SSDs are too expensive for $500 PC buyers. • Graphics Arts: Video and photo editors wear out storage by overuse. Replacing a 1TB hard drive will be cheaper than replacing a 500GB SSD. • General users: Unless you can justify a need for speed or ruggedness, most users won’t need expensive SSDs in their system. • Road Warriors: People that shove their laptops into their bags indiscriminately will want the extra security of a SSD. That laptop may not be fully asleep when you violently shut it to catch your next flight. This also includes folks that work in the field, like utility workers and university researchers. • Speed Demons: If you need things done now, spend the extra bucks for quick bootups and app launches. Supplement with a storage SSD or HDD if you need extra space (see below). • Graphics Arts and Engineering: Yes, I know I said they need HDDs, but the speed of a SSD may make the difference between completing two proposals and completing five for your client. These users are prime candidates for dual-drive systems (see below). • Audio guys: If you’re recording music, you don’t want the scratchy sound from a hard drive intruding. Go for the quieter choice. Now, we’re talking primarily about internal drives here, but the same applies to external hard drives. External drives come in both large desktop form factors and compact portable form factors. SSDs are becoming a larger part of the external market as well, The same sorts of affinities apply, i.e., road warriors will want an external SSD over a HDD if they’re rough on their equipment. 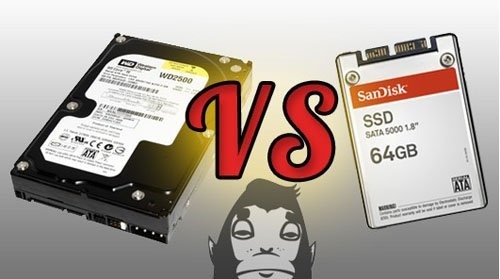 Back in the mid 2000s, some of the hard drive manufacturers like Samsung and Seagate theorized that if you add a few GB of flash chips to a spinning HDD, you’d get a so-called “hybrid” drive that approaches the performance of an SSD, with only a slight price difference with a HDD. All of it will fit in the same space as a “regular” HDD, plus you’d get the HDD’s overall storage capacity. The flash memory acts as a buffer for oft-used files (like apps or boot files), so your system has the potential for booting faster and launching apps faster. The flash memory isn’t directly accessible by the end user, so they can’t, for example, install Windows or Linux on the flash chips. In practice, drives like the Seagate Momentus XT work, but they are still more expensive and more complex than simple hard drives. They work best for people like road warriors who need large storage, but need fast boot times, too. Since they’re an in-between product, they don’t necessarily replace dedicated HDDs nor SSDs. In a dual-drive system, the system manufacturer will install a small SSD primary drive (C:) for the operating system and apps, while adding a large storage drive (D: or E:) for your files. While in theory this works well, in practice, manufacturers can go too small on the SSD. Windows itself takes up a lot of space on the primary hard drive, and some apps can’t be installed on the D: or E: drive. Some capacities like 20GB or 32GB may be too small. For example, the Polywell Poly i2303 i5-2467M comes with a 20GB SSD as the boot drive, and we were unable to complete testing, let alone install usable apps, since there was no room left over once Windows 7 was installed on the C: drive. In our opinion, 80GB is a practical size for the C: drive, with 120GB being even better. Space concerns are like any multi-drive system: You need physical space inside the PC chassis to hold two (or more) drives. Last but not least, an SSD and an HDD can be combined (like Voltron) on systems with technologies like Intel’s Smart Response Technology. SRT uses the SSD invisibly to help the system boot faster and launch apps faster. Like a hybrid drive, the SSD is not directly accessible by the end user; rather, it acts as a cache for files the system needs often (you’ll only see one drive, not two). Smart Response Technology requires true SSDs, like those in 2.5-inch form factors, but those drives can be as small as 8GB to 20GB and still provide performance boosts. Since the operating system isn’t being installed to the SSD directly, you avoid the drive space problems of the dual-drive configuration mentioned above. On the other hand, your PC will require space for two drives, a requirement that may exclude some small form factor desktops and laptops. You’ll also need the SSD and your system’s motherboard to support Intel SRT for this scenario to work. All in all it’s an interesting workaround. It’s unclear whether SSDs will totally replace traditional spinning hard drives, especially with shared cloud storage waiting in the wings. The price of SSDs is coming down, but still not enough to totally replace the TB of data that some users have in their PCs and Macs. Cloud storage isn’t free either: you’ll continue to pay as long as you want personal storage on the Internet. Home NAS drives and cloud storage on the Internet will alleviate some storage concerns, but local storage won’t go away until we have ubiquitous wireless Internet everywhere, including planes and out in the wilderness. Of course, by that time, there may be something better. I can’t wait.